Mantra is a code – a code to merge your mind with the infinite creative fire of life. When you recite mantra, you project the vibratory frequency of your own molecules into the infinity of the Cosmos. In this beautifully produced book by Bibiji Inderjit Kaur, wife of Yogi Bhajan, you will find hundreds of mantras to recite and repeat, to help with the personal needs you face in your life. By vibrating a mantra in rhythm with the breath, you can expand your sensitivity to the entire spectrum of vibration. You will learn to control the breath so that you can control your mind. When you can control your mind you control the universe. This collection has been lovingly collected, translated and commented upon by the devoted wife of the late Yogi Bhajan, the spiritual teacher who introduced Kundalini Yoga to the United States in 1969. His mantras are of a universal nature, transcending religious belief and embodying universal truths that every human being can experience. Bibiji Inderjit Kaur, widow of the late Yogi Bhajan, continues to inspire many yogis and spiritual seekers throughout the world with her light, grace and dedication to her late husband's work. 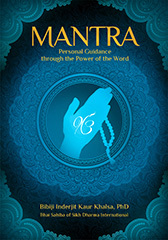 She has lovingly compiled Mantra, a comprehensive collection of hundreds of his beautiful mantras. In addition, her authentic vegetarian recipes presented in her Eastern cookery book, A Taste of India, including many of Yogi Bhajan's personal favorites, are exotic yet presented so clearly that they are easy to prepare.